Russian analyst predicts Soviet-style collapse of U.S.
Take a look at all the great new countries we'll soon be able to visit. The economy's in the tank, we've got a lame duck president, unemployment is skyrocketing -- it's enough to make a Cold War Russki cheer for the demise of the United States of America. "The dollar is not secured by anything. The country's foreign debt has grown like an avalanche, even though in the early 1980s there was no debt," crowed Professor Igor Panarin, reports RIA Novosti. "By 1998, when I first made my prediction, it had exceeded $2 trillion. Now it is more than 11 trillion. This is a pyramid that can only collapse." And how does Panarin, of the hilariously named Diplomatic Academy of the Russian Ministry of Foreign Affairs, foresee this failure playing itself out? 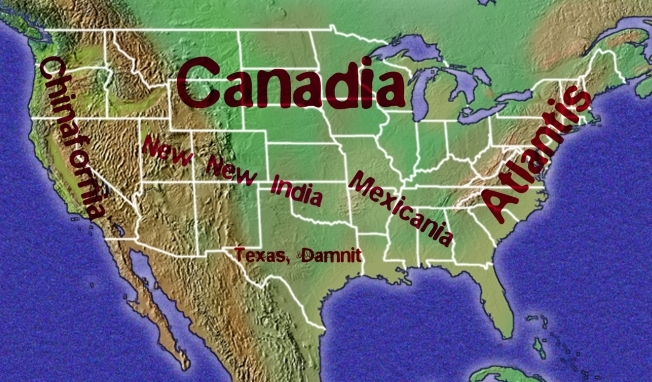 With the country splitting up into six new nations, of course. The Pacific Coast: will come under the rule of its large Chinese population, the South will devolve into a Mexican satellite country, a Texas separatist movement will finally come to fruition, the elite cultural/intellectuals snobs of the Atlantic states will turn their backs on the rest of the country, an undefined amalgam of five poor central states will return to Indian rule and of course the northern states will finally fall under the strong influence of their Canadian neighbors. And maybe, just maybe, Alaska will return to Mother Russia. "It was only granted on lease, after all," noted Panarin. Doesn't Panarin realize that we effeminate, over-educated sissies of the Eastern seaboard love our arugula too much? That Chinese people make up less than 15 percent of California? That the only influence Canada has on America is the occasional cold front? For a nation such as ours to suffer such an epic collapse requires decades of repressive government control of all aspects of daily life by a string of murderous dictators. The 60-year-old Panarin, of all people, should know this.